If you’re looking for a WordPress SEO plugin, then you will likely come across All in One SEO Pack because it is one of the most popular WordPress plugins ever created (over 27 million downloads). In this beginner’s guide, we will show you how to install, setup, and use All in One SEO plugin in WordPress. Why You Need a SEO Plugin for WordPress? Search Engine Optimization (SEO) helps make your website rank higher in Google and other search engines. While WordPress provides a SEO friendly setup right out the box, there are still many things that you can do to improve your SEO such as adding meta tags, generating XML sitemap, avoiding duplicate content, etc. All in One SEO Pack helps you do all these things with an easy to use interface that blends into your WordPress dashboard. Note: At WPBeginner, we use the Yoast SEO plugin, but both All in One SEO pack and Yoast SEO are great plugins to optimize your website for search engines. The basic All In One SEO plugin is available for free. There is an All in One SEO Pack Pro version that adds additional features such as video sitemaps, eCommerce SEO, 1 year of professional support, and several other features. It costs $79 per year, and they are offering WPBeginner readers a $20 discount if you use our All In One SEO Pack coupon. Having that said, let’s take a look at the setup process. First thing you need to do is install and activate the All in One SEO Pack plugin. For more details, see our step by step guide on how to install a WordPress plugin. Upon activation, the plugin will add an All in One SEO menu item in your WordPress admin menu. You need to click on All in One SEO » General Settings to configure the plugin settings. On the settings page, you will notice a bunch of settings. Each setting option has a question mark next to it and clicking on it will show you a help message about the option and what it does. The first option on the General Settings page is to set canonical URLs. Specifying a canonical URL for each post allows you to avoid duplicate content penalty from Google. In a typical WordPress installation, a single post is displayed on several locations such as your homepage, archives page, author page, category and tag pages. That’s why we recommend using article summary or excerpts instead of full posts in WordPress archive pages. Publishing full articles on all pages creates duplicate content. Under homepage settings section, you can specify a title for your homepage. This title can be different from your WordPress website’s title. You want to make it catchy and use your most important keywords in the title. If you leave this field blank, then All in One SEO will use the default WordPress website title. Whether you use a different title or the same title as your blog, make sure that it contains your website’s main keywords. 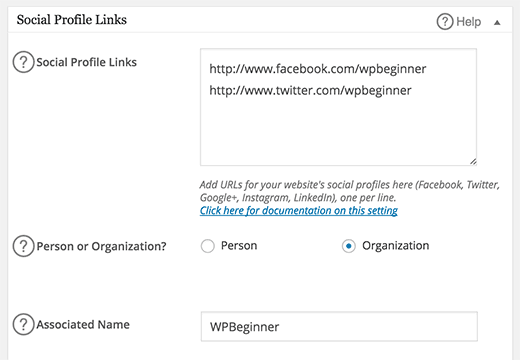 For example, our homepage title is WPBeginner – Beginner’s Guide for WordPress. In the homepage description field, you need to provide a brief description of your website. Keep it under 156 characters and try to use your website’s most important keywords in the description. However do not go overboard with keywords in the description. You want to make sure that it is readable and easy to understand. If you leave description field blank, then All in One SEO will not use them on your homepage. If you want to get maximum benefits, then you must fill these in. If you are using a static front page, then you can click enable next to ‘Use Static Front Page Instead’. 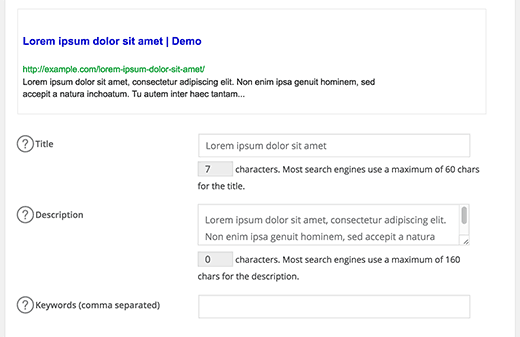 You can now edit your front page and add title and description under All in One SEO meta box. 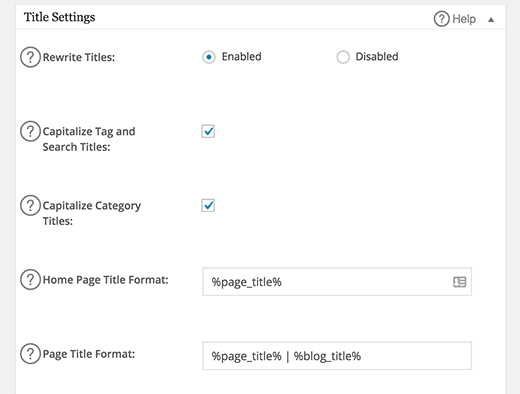 Title settings allow you to set the default title templates for every page generated by WordPress. This could be a single post, main page, archives, tags, or category pages. Each page generated by WordPress has a <title> set with in your WordPress theme files. The first option, rewrite titles, allows All in One SEO Pack to rewrite titles. It is enabled by default to override any theme settings. We recommend that you leave this setting as is because we believe that themes should not add SEO options. You can also modify how titles for your single, archive, and other pages appear by changing the predefined tags used for different page titles. We would recommend leaving them as it is for optimal results. if you are creating a lot of landing pages, then the only thing you should change is your page title format. 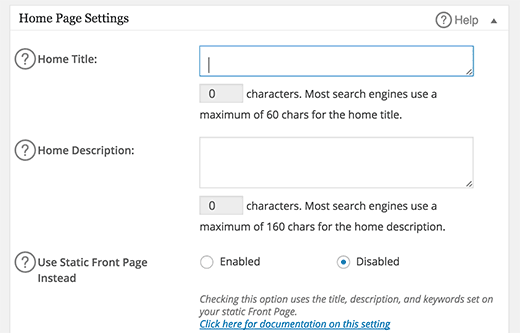 Get rid of | %blog_title% part from page title format, so your site title is not taking up your 60 character limit, and your entire page title shows up in search. Under custom post type settings, you can enable All in One SEO plugin for any custom post types used on your site. For example, if you are using WooCommerce then your products are a custom post types and they will be shown here. You can enable the SEO options for products. Not all post types will need Advanced SEO settings. For example, if you are using Envira Gallery plugin, then your galleries will appear here as a custom post type titled ‘Envira Galleries’. Since galleries are usually added into WordPress posts and pages, you don’t need to have advanced SEO option for them. However if you’re using Envira’s standalone gallery addon to create standalone galleries, then yes you should enable SEO for that custom post type. 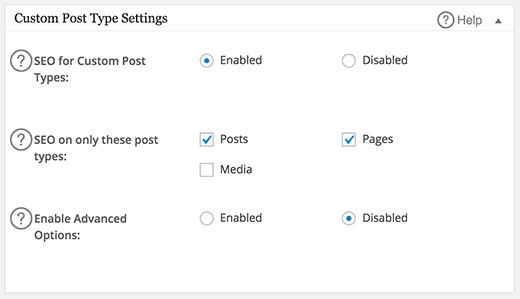 Display settings will allow you to show post’s SEO title and description on posts screen. It is enabled by default and you can leave this setting as it is. This is where you will add webmaster verification code provided by Google, Bing or Pinterest to verify ownership of your website. We highly recommend that you sign up for Google Webmaster Tools and Bing Webmaster Tools because it will help your SEO. Connecting your site will help these search engines to notify you when there is something wrong with your website. These webmaster tools will also provide you with useful insights about your site, and your search engine rankings. You can then use that information to plan your content strategy and improve your site’s SEO. If you use Pinterest to bring traffic to your WordPress site, then verifying your site with Pinterest will allow you to use Pinterest Analytics. Under the Google settings section, you can enter your Google Plus profile URL to add google verified authorship. Once you add the link there, you must go to your Google+ profile about page and add your site in the contributors section. Refer to the authorship tutorial that we linked above. Even though Google has discontinued using author profiles in search results, some SEO folks believe that having it is harmless if not useful. 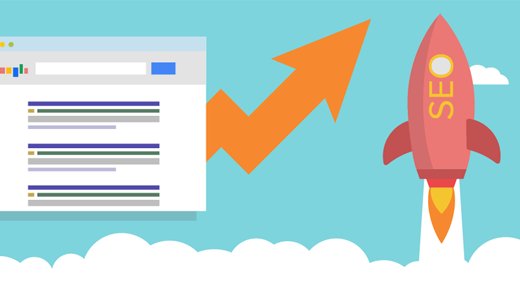 You can also add your Google Analytics ID for your website, and All in One SEO will automatically add your Google Analytics code to your site. This section allows you to disable indexing of category and archive pages on your site by search engines. Some SEO experts believe that this is duplicate content, and it is better not to get these pages indexed. However, others argue that you should disable the ones that you don’t think are necessary and keep useful archives like category archives and tag archives. All in One SEO enables noindexing for category and archive pages by default, we would recommend that you un-check categories. 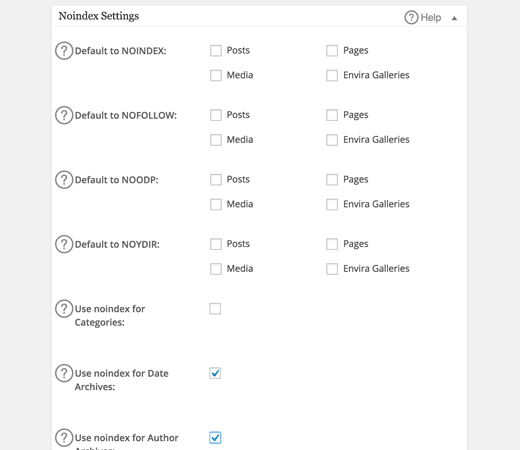 If you run a single author blog, then we recommend that you enable noindex for author archives too. But if you run a multi-author site, then you should let search engines index author archives. Advanced settings section allows experienced webmasters to modify certain aspects of their website’s optimization. Like excluding pages, adding code to headers, auto-generate descriptions, and so on. Unless you know what you are doing, we recommend you to leave this section as it is. Many SEO experts believe that there is no benefit of using the meta keywords tag any more. On the other hand, some experts believe that they are still useful. All in One SEO has keywords disabled by default. If you want to use keywords, then you can enable them here. We use meta keywords on our website because we believe that even if they are not useful, there is no harm in adding a few keywords with each post. 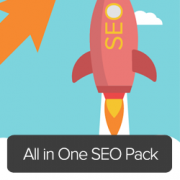 All in One SEO Pack is a powerful plugin, and as you have seen it has tons of options. Some of its features are not available to users out of the box. You will need to activate them by visiting All in One SEO » Features Manager page. Creators of All in One SEO believe that some users may already be using other plugins for XML sitemaps and for Facebook Open Graph meta tags. If you are not already using other plugins for that, then you must activate these two addons to gain maximum SEO advantage. Enabling these features will add Social Meta and XML Sitemap items under your All in One SEO settings. All you need to do is visit All in One SEO » XML Sitemap page and check the box next to ‘Notify Google’ and ‘Notify Bing’ options. Leave rest of the settings as they are and click on the update options button. First you need to visit All in One SEO » Social Meta page and Scroll down to the homepage settings section. 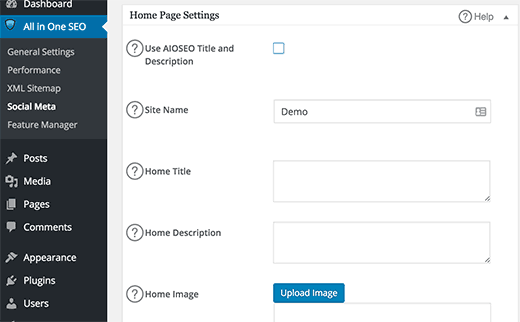 This is where you will set the title, description, and an image for your site’s home page. However, since we have already set homepage title and description in the General settings, you can check the box that says ‘Use AIOSEO Title and Description’. Next you need to upload an image because this image will be used by social sites like Facebook and Twitter to accompany your link when it is shared on these platforms. When you scroll down on this page, you will see the social profiles link section where you can add your social profile URLs one link per line. The next section allows you to set up Facebook admin and app ID. 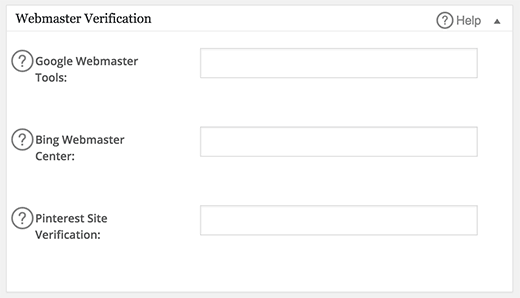 Settings in this section will allow you to add Facebook author tag, and get Facebook Insights for your website. 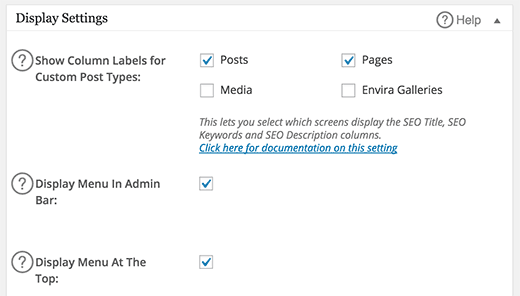 All in One SEO plugin adds a meta box in your WordPress post/page edit screen. However, many beginners are often confused about how to use that properly. What kind of title should I use? Or how to write a description? So before you move on to setting up All in One SEO Pack, we would like you to check out our guide on how to properly use SEO functions to optimize your WordPress posts. Even though this guide shows Yoast SEO plugin in the screenshots, the basic concepts are the same, so it will be helpful for all. To optimize single posts and pages, you can enter SEO title, description, and keywords for each post you write. 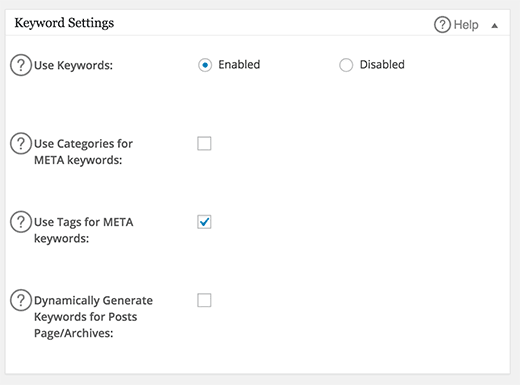 Settings on this meta box will override your global All in One SEO settings. If you leave them blank, then All in One SEO will use your global settings to fill in these fields for you. It will use your post title as title, posts excerpt as description, and tags as keywords. If you want to get maximum results, then we recommend that you fill these fields manually rather than leaving them blank. Apart from these, you can also set nofollow and noindex options if you do not want to get a specific post or a page indexed on search engines. For beginners, its best to avoid using these options. Lastly, you can even disable All in One SEO for a particular post or page, but we’re not sure why you would want to do that. That’s all you have optimized your single post or page for maximum SEO benefit. We hope this user’s guide for All in One SEO Pack helped you set it up on your site. You may also want to see our list of 9 best WordPress SEO plugins and tools that you should use. Thanks for sharing it was really helpful. Please contact plugin support to see if they can help you fix it. I downloaded the All-in-one SEO pack plugin. On my individual product page, there are 2 sections of the All-in-one- SEO pack for me to fill up. One section has the (Use this form to enter All in One SEO Pack details for this Product.) while the other has a preview snippet (showing what the page would look like in the search engine). There are some duplicate forms for both sections (such as Title, Description, and keywords). Do I have to fill them up for both sections or just one section would do? Hi, how i can change url by this plugin? I have a Question. When ‘Use Static Front Page Instead’ option is enabled, how to edit the Title Formats? For eg, the edit option under Home Page Title Option provides a box that contains ‘%page_title%’ Can one delete these words and write his own?. Is there any guideline for Editing the boxes? Hi, I just meet your post and I have a question. I wrote all the meta descriptions but seaching by Google don’t show these meta descriptions. I sent a new sitemap and a new robots.txt with Search Console. Please view your site’s source code to make sure that you have keywords and description meta tags in the head section. If you do, then you can just wait for Google to refresh its index. Yoast have Local SEO. What plugin can I use if I use AIO Seo Pack to optimize my Local SEO? 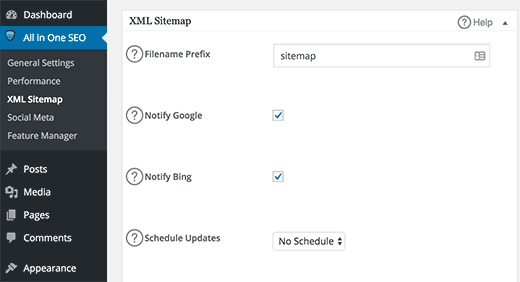 Will this plugin support to generate dynamic sitemap? In my site I have 25000 url’s. Most of them are dynamic url’s. How can I generate sitemap for this dynamic site? 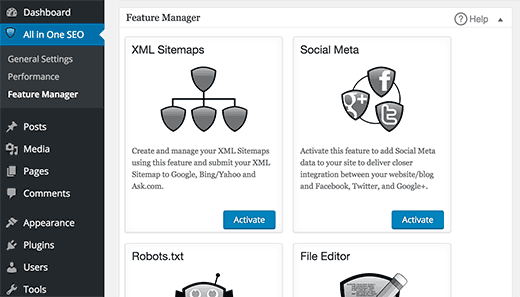 I’ve activated XML Sitemap in Feature Manager. When I visit the Sitemap page however, there are no boxes for “Notify Google” or “Notify Bing”. I shut down and restarted but still no boxes to check. Does free version of all in SEO pack plugin provides sitemap xml? I have using All in one SEO plugin, I am working on SEO for my website, my issue is I have used a post with few tags, now audit says duplicate content for the post. so three post are same but its displaying in different url, so audit report says this content is duplicated. All in One SEO Pack installed itself under Word Press Settings where only the SEO is offered no Sitemap or other menu options appear as when All in One SEO Pack installs to the WP Dashboard. Is there a way to move All in One SEO Pack from WP Settings to WP Dashboard to enable its menu? Does All in one SEO Pack automatically put social icons on my site? wordpress, klopp theme. I already have twitter icon on my site. If not, add a plug-in? I have a question. 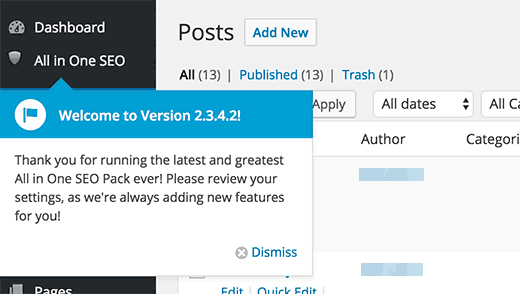 There is always an update option of of All in one seo pack plugin, so should we do update regularly? Yes, you should always keep all your WordPress plugins updated. I do not see anywhere to add or edit a Facebook author tag? Perhaps this is something missing from the most recent version? Is it possible to upload the data in the All in One SEO Pack fields from a spreadsheet? I have a question shouln’t it be possible to see the SEO Description SEO Title SEO Keywords when you are in the backend of wordpress and click post? I have all the content in all in one seo but there is nothing displaying on my general post page where I have the overview of all post. i am getting a 500 page error and i cant get access now to uninstall from wordpress.. is there a way to uninstall without going through wordpress..?? See our guide on how to deactivate all plugins when not able to access wp-admin. Once you have deactivated all plugins you can go to Plugins page in WordPress admin area and then activate the plugins that you want to keep. I filled in the snippet, updated page but title does not appear in browser title/tab. Any ideas please? I have a problem with All in One with Loco Translations with the social meta. My site is in two languages and I can specify only one of them. The last I write it takes for every language. Everyone have the same problem? Can I export all my SEO data (description and title) from Yoast to All-in-one-seo-pack? I´m having problems with Yoast but I don´t want to lose all data. Yes you can. You can try SEO Data Importer plugin. It usually takes some time for a new website to start appearing in search results. Quality backlinks and frequent updates usually help. I’m using the WP Hueman Theme, and I’d like to switch my seo content from the “add meta tags” plugin to the “all in one seo pack”. I tried to do it with the seo data transporter plugin, but it didn’t work: it says that there are zero compatible files. Is there any other way to save or transfer the seo data? Try SEO Data Transporter plugin. I have a static page on my website. Do I understand correctly that after enabling it I just leave all the title format settings as they are? Im a bit confused as to whether I need to type anything in the boxes! 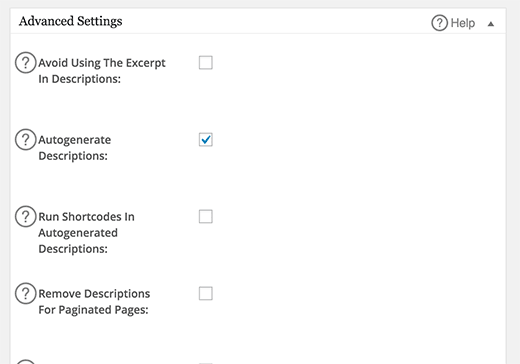 You can edit the page, scroll down a little to the All in One SEO settings metabox. There in the title field you will see how the title will appear on search engines. You can change it if you want. Nice guide and I need a refresher! I would have appreciated an explanation of “Canonical” – you mention it right at the beginning and then rush on. Canonical is a special tag which tells search engines that even though this content appears elsewhere on your site, its permanent location is this particular URL. This helps avoiding duplicate content issue. Your SEO plugin would automatically handle that. it is possible to set SEO Titel, SEO Description and SEO Keywords in bulk? It is time consuming to set image by image. Thank you so much for this post! You’ve helped me so much! A couple questions though. Does the Social Meta automatically update your Facebook, Twitter, and G+ accounts when you make a new post? And does it display links on your pages and posts for visitors to share on their social media accounts? Thanks again! No it does not. It is used when someone else shares a link of your site on their social profiles. The meta tags help those social platforms pick up things like title, description, featured image, author name, author profile, etc. I’m trying to find a straightforward answer if All in One SEO allows you to implement Google tracking codes into pages. Would they in any way clash depending on where they place the code? All in One SEO Pack allows you to add Google Analytics into your WordPress pages. 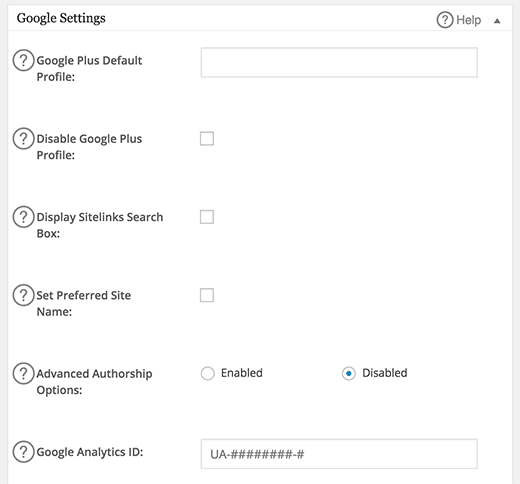 If you want to use another plugin for that, then simply don’t enter your Google Analytics ID into All in One SEO Pack’s settings. Why would I want to use All in One SEO if I am already using SEO Yoast? Excellent! All readers should keep a copy for easy access. Invaluable! Thank you!